Have we a dandy turtle necklace collection or what? 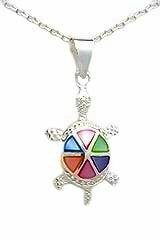 And the best part is you'll get very good recommendations for matching chains to turtle pendants yet are free to do your own mix and match very easily. After the sterling silver section, I'll show you necklaces in other materials. Knock yourself out, Turtle lover! Tortoises and Terrapins also feature. 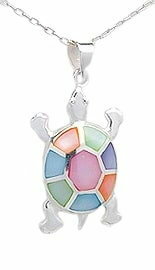 Get the Turtle sterling silver necklace that is just right for you by buying your favorite turtle pendant and a matching chain. We've helped you with obtaining the right match by preselecting a special range of 925 sterling silver chains that best match our premium quality sterling silver turtle pendants and furthermore, try on all the chains with each pendant to identify the best looking combination. 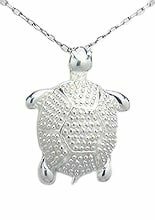 However, you may have your own preference or you may be looking for a sterling silver Turtle necklace for men or for women and would prefer a chain that is more masculine or feminine. 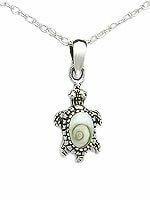 Enjoy a 15% discount off the chain price when you buy a pendant in the same order to make up a Turtle sterling silver necklace. 1. 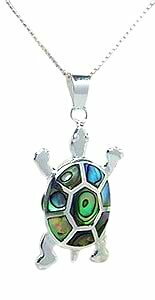 Purchase a turtle pendant by clicking its 'Add to Cart' button. 2. Click on the recommended chain's image and you'll find yourself at the sterling silver chain page. Add the chain to your order (click the lower 'Add to Cart' button). You can pick any other chain if you wish. The 15% discount applies just the same. The height measurement of these pendants does not include the bail. 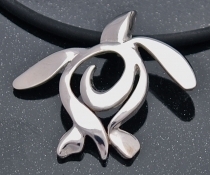 The pendant is an artistic expression of the Leatherback Sea Turtle's silhouette. This design is characterized by simple outlines with spaces as part of the artistic presentation. That's a given, isn't it? 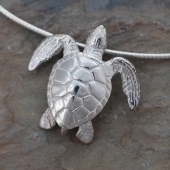 The whole sterling silver Leatherback Sea Turtle necklace is streamlined. Minimalism and the sensation of fluidity run throughout the chain and pendant. sterling silver Cable Chain B. 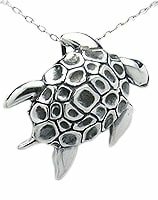 The Leatherback Sea Turtle sterling silver necklace appears very soothing to your eyes as the spaces in the pendant are echoed on the chain. 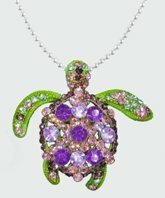 The best matching chain for this artistic giant of a sea turtle? 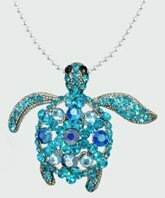 That depends on whether you are getting a men's sterling silver sea turtle necklace or a women's sterling silver sea turtle necklace. This combination is very alluring. 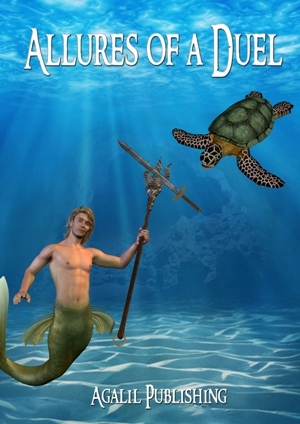 It'll even make you think the turtle is female. sterling silver snake chain makes everything looks smart, clean lined and masculine. This design is also available in pewter, bronze and brass. Click the links or photographs for details. sterling silver rope chain is an eye feast. 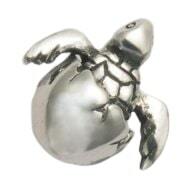 Intricacies present all over the Green Sea Turtle continues on the head and extends seamlessly to the sophisticated twists and twirls of woven silver in the chain. 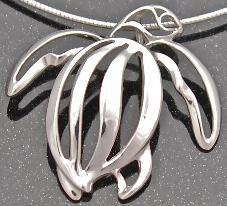 You can't help but notice you are eyeballing a creature in silver, meticulously carved and it is hanging on more richness of silver. This is almost opulent. You've got to have the appetite to flaunt with this one. 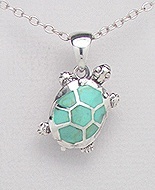 The Turtle, Terrapin and Tortoise necklaces below are grouped with the same chain recommendation. sterling silver Box Chain. These two chains match all the pendants featured in this group. For more details on these pendants please click the pendant page. This page is concerned with helping you decide on the matching chain. sterling silver Cable Chain A, a much thinner version of sterling silver Cable Chain B. Go for this chain if you prefer thinner chains and you'll save quite a bit too! It works especially well with smaller pendants. Click the 'Add to Cart' button of the pendant to order it.  Then click on the chain image to order the chain on the 'chain page'. 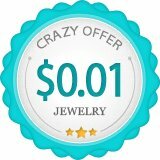 Are you concerned your turtle jewelry gifts will not be appreciated? 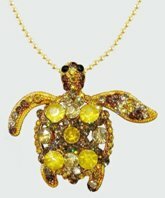 We have created ‘Gift Enhancers’ like Allures of a Duel to turn your turtle jewelry into perfect gifts. sterling silver Cable Chain B. Being bigger and heavier pendants, Cable Chain B is about the thinnest chain recommended. sterling silver snake chain works well here. Generally, disc pendants goes well with rounded chains or chains with circular links. The sterling silver Cable Chain B and sterling silver snake chain above match well for an outstanding nesting sea turtle necklace. Female sea turtles return to the beach where they were born to lay their eggs. Have you seen one in action? Watching a sea turtle nest is an unforgettable experience. A nesting turtle would find a dark and quiet spot on the beach and use all four limbs to dig a pit. Once the eggs are laid, the mother covers the eggs with sand using her rear flippers. She then returns to the sea, and never visits the nest again. 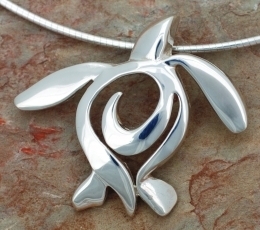 The pendant portrays a nesting turtle making its way out of the sea, and up the beach in the middle of the night. 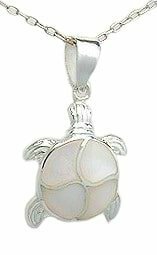 If you would like more information on the Sea Turtle pendants, click Sterling Silver Sea Turtle Pendants to visit the dedicated pendant page. The necklaces above are all sterling silver and the ones below are our non-silver collection. 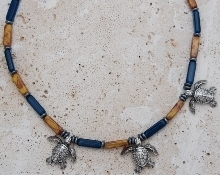 3 three-dimensional Sea Turtles are featured in this beautiful handcrafted necklace. 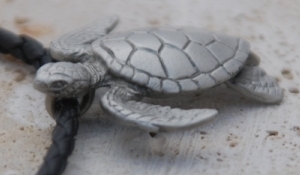 The finely detailed turtles are made from high quality pewter and plated in antique silver. The blue and brown Czech beads are a great find. They are so exquisite, they'll make a stunning necklace by themselves. Hematite rondelle glass beads are selected as spacers and the clasp is sterling silver. In case you wonder if the cable used for stringing the beads and turtles are strong enough, it is a durable 49 strand stainless steel cable wire. The necklace is about 17 inch long. 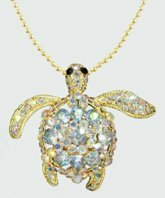 We have great looking Sea Turtle jewelry in a number of materials and these are about crystals. It is all about stuffing as many bright, beautiful crystals as possible onto the turtles. Of course, done aesthetically through different crystal sizes and color matching. The length of the chain is 18" with a 3" extender. If you like crystals, you can't go wrong with these.